Microsoft is seemingly uninterested in launching a Surface Pro 5 anytime soon, thus leaving the door open for hardware makers like HP to capitalize on an obvious void in the market. The company’s new Elite x2 1012 G2, announced on Wednesday, looks to be the perfect example of a Surface Pro 5 stand-in. 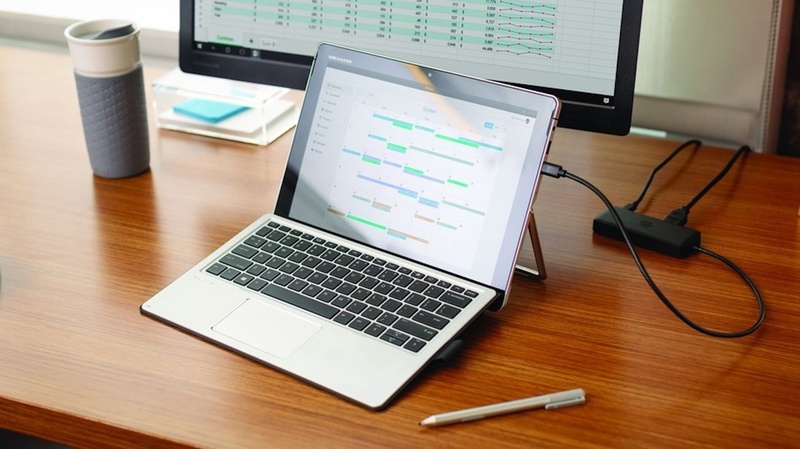 HP’s latest 2-in-1 features a 12.3-inch LED display coated in Corning Gorilla Glass 4 that packs a WQXGA+ resolution of 2,736 x 1,824 pixels and can be configured with up to an Intel Core i7-7600U processor, Intel HD 620 graphics, 16GB of RAM and up to 1TB of solid-state drive storage (512GB M.2 SATA and 512GB M.2 PCIe NVMe). Other noteworthy features and specifications include dual-band 802.11 a/b/g/n/ac Wi-Fi, Bluetooth 4.2, an 8-megapixel rear-facing camera, a 5-megapixel video camera up front and a full complement of sensors. In terms of I/O ports, the machine features a USB 3.1 Type-C port, a standard USB 3.0 port, a microSD card slot, a SIM card slot for wireless data and a combination headphone / microphone jack. A 47WHr battery promises up to 10 hours of battery life on a single charge. A recharge of 50 percent can reportedly be reached in just one hour thanks to HP’s Fast Charge technology. Look for the HP Elite x2 1012 G2 to arrive sometime in July with pricing starting at $1,099 for the base model and scaling up accordingly.